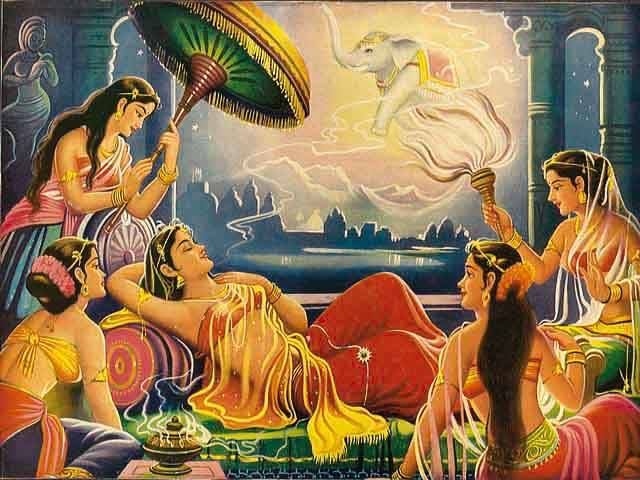 A long time ago in India, there lived a king named Suddhodana and a queen named Mahā Māyā. One full moon night on moth of July, the Queen dreamt of four guardian devas (deities) carried her with the soft bed where she is sleeping, to the Lake Anotatta in the Himalayan Mountain Range. The the maids clothed her in heavenly cloths, anointed her with perfumes, and bedecked her with divine flowers. A white baby elephant (baby tusker) holding a white lotus flower in its trunk went round her three times and entering her womb through her right side of the abdomen. The dream came to an end and the Queen was suddenly awakened. Wise men explained that the Queen was going to give birth to a prince. "A great joy is to be yours, O' king, O' queen. A son will be born to you, distinguished by the favor of the Gods. If, one day, he should renounce royalty, leave the palace, cast love aside; if, seized with compassion for the worlds, he should live the wandering life of a monk, he will deserve marvelous praise, he will richly deserve magnificent gifts. He will be adored by the worlds, for he will give them that which they hunger after. O' master, O' mistress, your son will be a Buddha!"